I know many people with Celiac disease, or those with a gluten intolerant, miss the taste of cinnamon buns. Although I do have a fantastic gluten-free cinnamon bun recipe, sometimes you just don’t want to take the time and effort that it takes to bake a batch. 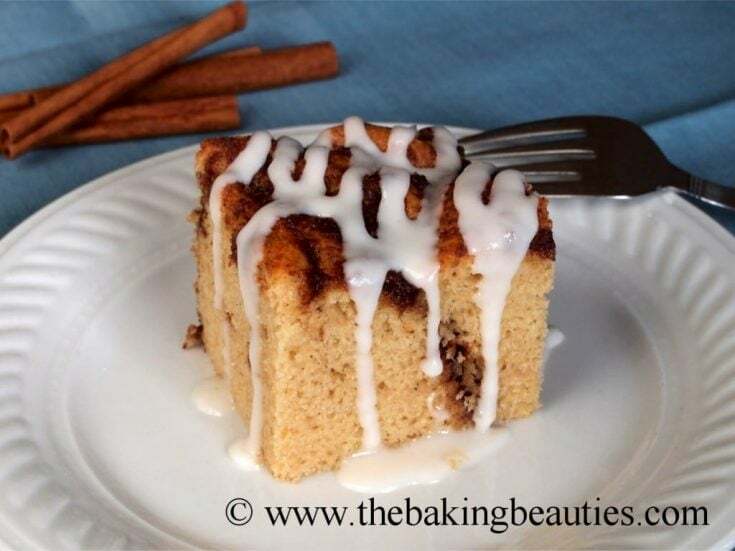 If that’s you, don’t fret, you can still have the wonderful flavour of cinnamon buns in a quick and simple cake! This cake is a nicely textured, slightly heavier cake with a brown sugar and cinnamon ribbon throughout. Top it with a vanilla icing drizzle, and you are set. This cake is both gluten-free and dairy-free when you use the dairy-free milk and butter of your choice. For this recipe I used soy milk and Earth Balance butter, but if dairy isn’t a problem, you can use regular milk & butter as well. This gluten free Cinnamon Bun Cake is a nicely textured, slightly heavier cake with a brown sugar and cinnamon ribbon throughout. Top it with a vanilla icing drizzle, and you are set. Preheat oven to 350 degrees F and grease one 9x9-inch pan. In the bowl of a stand mixer, measure out 1 cup brown rice flour, sorghum flour, potato starch, tapioca starch, xanthan gum, salt, 3/4 cup granulated sugar and baking powder. Mix until well combined. In a small bowl, whisk together 1 cup milk, eggs, 1 1/2 tsp vanilla extract and oil. With the mixer running, slowly pour the wet ingredients into the dry ingredients. Mix until well combined, scraping down the bowl as necessary. Mix until just blended. Scrape batter into the prepared pan and spread evenly in the pan. In a small bowl, mix together the softened butter, brown sugar, 2 Tbsp rice flour, cinnamon, and pecans (if using). Stir until the mixture resembles wet sand. Spread evenly over the cake, and using a butter knife, gently swirl through the cake, creating the marble-effect. Do not over mix it though. Bake in preheated oven for 35-40 minutes, or until a toothpick inserted into the center comes out clean. Remove from over and allow to cool completely. When the cake has cooled, prepare the vanilla icing. In a small bowl, stir together the confectioners' sugar, 1/2 tsp vanilla, and 1-2 Tbsp milk. Start with one tablespoon and add more if necessary to get the consistency that you want. You can use a spoon and drizzle the icing over the cake, or place the icing into a small zipper-seal bag with a small corner cut off, and drizzle it over the cake that way. « Gluten-free "Six Layer Dessert"
Wow…good job..that looks perfect…I’ll be making that one! this really looks AMAZING Jeanine!! Great job! This would be great to take to work for breakfast potlucks!! Oh, a breakfast potluck, this would be perfect! Great idea! Delicious! The birthday boy loved it (in fact my facebook/pinterest profile picture is him standing with his Birthday breakfast) along with the rest of the family and some friends who stopped by and eyed it and innocently asked if it was home made (as if the cake pan and mess weren’t enough evidence). We also made your raspberry cupcakes for his school and the kids scarfed them up – I accidentally doubled the recipe so the Husband took a dozen or so to work – they were gone in 20 minutes and no one knew they were gluten free – Thanks for the recipes! That is awesome!! I always LOVE to hear the stories that involve making kids happy. I mean, we as adults, we can adjust. But I feel for kids that feel left out. Glad that both recipes were a hit with the birthday boy. Happy Birthday!!! This cake is SOOO good! Thankyou SO much for sharing it as part of our Gluten Free Baking With KitchenAid event. You are just AMAZING! Thanks for this recipe. 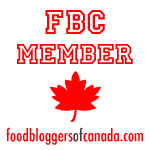 I’m just discovering your exciting blog! If I wanted to make this in a bundt pan, do you think I’d need to double the recipe or maybe do 1.5? We tried this cake and it was excellent. It reminded me of the apple cake that my mother used to make so I think the next time, I’ll add some cup up apples in with the dough. Excellent cake base to experiment with too, I think! Thanks for posting. I made this cake last night on a whim. It was super quick and easy to put together. I didn’t swirl the topping, just put it on top like a cinnamon coffee cake. I also drizzled with icing. I served it for breakfast this morning and it is wonderful. Mmm… now I wish I had a slice to have for breakfast this morning! Thanks for the feedback, Pam, so glad to hear that it was a hit! I made this two days ago, exactly as written (except I didn’t have any pecans), and it still tastes GREAT! This recipe is a keeper for sure–one of the best things I’ve baked in a long time. Thanks so much for the recipe. I tried this recipe one day when I was just craving a streusel-topped coffee cake. I must say it turned out absolutely fantastic! The texture of this cake is perfect. 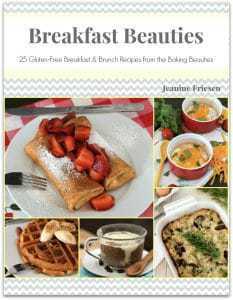 (I am going to refer all of my gluten free friends to Jeanine’s blog, because her recipes are so good.) I cut the cake into 16 squares and froze them in a plastic container. When I want a treat, I put one square into a small dish and microwave it for 30 seconds. Perfect! It tastes freshly baked. I did omit the glaze/icing because for me, it just isn’t necessary. The cinnamon streusel topped cake does it for me. I wanted to add that one day I had some blueberries to use up, but not enough for muffins. So I made this cake again, adding a bit of lemon extract along with the vanilla. I then sprinkled the top with blueberries before adding the streusel topping (which I made for this cake using nutmeg as part of the spice component instead of all cinnamon). The blueberry coffee cake turned out excellent too, but it did take a bit longer to bake. Thank you, Jeanine, for another wonderful recipe! I plan on making the baked chocolate doughnuts soon, and maybe the caramel apple coffeecake and some of the cookie recipes. You have put the fun back into baking for me! Thank you, I made this yesterday and I loved it, as well as my whole family. I replaced the rice with Millet. We enjoyed it with coffee this morning.